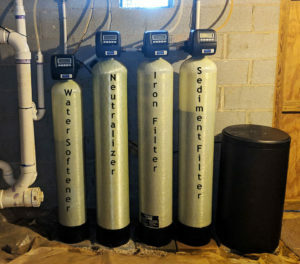 This customer in Asheville had quite a few issues with their well water. The pH is extremely low as well as having high iron and hardness. We installed a sediment filter to remove particulates, an iron filter to remove iron, a neutralizer to raise the pH and a water softener to remove the hard water. Asheville customer is very happy with their investment!